A new milestone for the project and a happy "family" celebrating it: Director-General Kaname Ikeda after the signature of the Procurement Arrangement for the ITER vacuum vessel with Didier Gambier, Director of the European Domestic Agency. Relief and joy were in the air on Thursday when the ITER Organization and the European Domestic Agency signed the Procurement Arrangement for the supply of seven of the nine sectors of the ITER vacuum vessel. The vacuum vessel is the double-walled steel container in the very centre of the ITER machine in which the plasma is contained by a magnetic field. The Procurement Arrangement was signed by the Director-General of the ITER Organization, Kaname Ikeda, and the Director General of the European Domestic Agency, Didier Gambier. The total value of this Procurement Arrangement—the twenty-ninth that the ITER Organization has signed—is approximately EUR 150 million. "The signature of the ITER vacuum vessel today marks a new milestone for the project and for Europe, which is responsible for the major share of this procurement," Gambier said after the signing. "This is also a big step ahead for the Europen Domestic Agency and it underlines, here again, that Europe is ready, that we are building!" The other two sectors of the vacuum vessel will be provided by the Korean Domestic Agency as set out in the procurement sharing for the vacuum vessel. 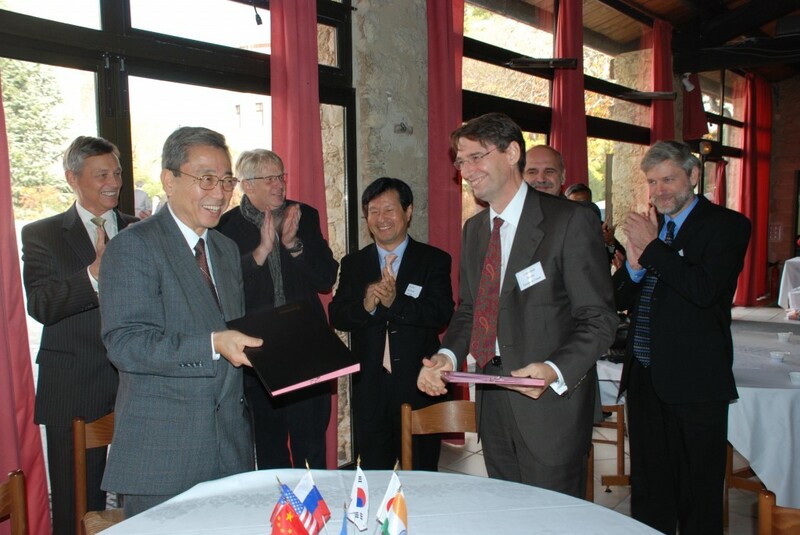 Korea signed its share of vacuum vessel procurement on 19 November 2008, exactly one year before. The ITER vacuum vessel will be the biggest fusion furnace ever built. It will be twice as large and 16 times as heavy as any previously-manufactured fusion vessel: each of the nine torus-shaped sectors will weigh about 450 tonnes. With shielding and port structures added, it will reach 5,116 tonnes, with an external diametre of 19.4 metres (internal diameter: 6.5 m). Once assembled, the whole structure will be 11.3 metres high. The primary function of the vacuum vessel is to provide a hermetically-sealed plasma container. Its main components are the main vessel, the port structures and the supporting system. The main vessel is a double-walled structure with poloidal and toroidal stiffening ribs between 60 mm thick shells that reinforce the vessel structure. These ribs also form the flow passages for the cooling water. The space between the double walls will be filled with shield structures made of corrosion-resistant austenitic stainless steel. The inner surfaces of the vessel will be covered with a blanket to provide shielding from the high-energy neutrons produced by the fusion reactions. A certain number of these will also be used for tritium breeding concepts.